Here’s one you’re not seeing covered by the establishment teleprompter readers. The Justice Department is going before the Supreme Court and arguing that the Obama administration has the authority to trump the Constitution with international treaties. 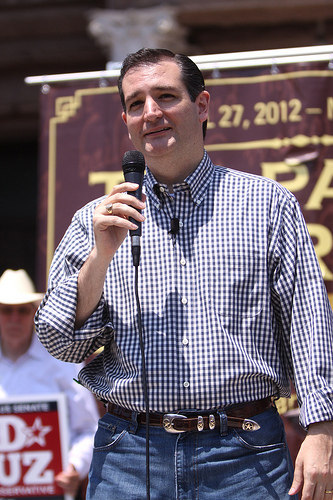 Texas Senator Ted Cruz is stepping up to the plate to fight this globalist broadside. In a speech delivered to the Heritage Foundation, Cruz said the Justice Department’s arguments before the highest court represent “an absurd proposition” that “could be used as a backdoor way to undermine” Second Amendment and other constitutional rights the global elite are working overtime to eradicate. The case at issue is Bond v. United States. It concerns a woman charged with violating an international ban on chemical weapons. She stands accused of harassing a onetime friend involved in an affair with her husband. The federal government is arguing that it may use the international law to prosecute the woman, thus violating basic structural guarantees that exceed Congress’ enumerated powers, according to Bond’s lawyers. “If the administration is right, the treaty power could become a backdoor way for the federal government to do everything from abolishing the death penalty nationwide, to outlawing homeschooling, to dramatically curtailing the states’ rights to regulate abortion,” Carrie Severino of the Judicial Crisis Network told the Washington Examiner.